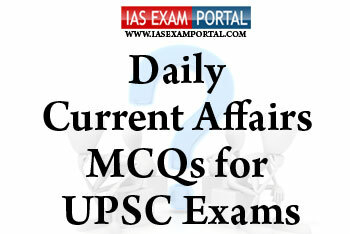 Current Affairs MCQ for UPSC Exams - 5 DECEMBER 2018 | IAS EXAM PORTAL - India's Largest Community for UPSC Exam Aspirants. 1) These are normal individual rights as applied to members of racial, ethnic, class, religious, linguistic or gender and sexual minorities; and also the collective rights accorded to minority groups. 2) Minority rights, as applying to ethnic, religious or linguistic minorities and indigenous peoples, are an integral part of international human rights law. 3) The word minority is defined in the Indian constitution in articles 350A to 350B. Q2. Which of the following statements regarding Persons With Disabilities(PwD) are true ? 1) People with disabilities are considered to be the largest minority in the world. 2) The Rights of persons with disabilities act 2016 mandates that all existing public buildings be made accessible within five years, and requires service providers, whether government or private, provide accessible services within a period of two years from the notification of the law. 3) In relation to employment, the new law provides 4 % quota from the total vacancies identified for persons with disabilities in government jobs. 1) It is a survey-based measure that asks respondents about changes in their perception of some key business variables from month before. 2) The index figure above 50 denotes expansion in business activity and anything below 50 denotes contraction. 3) It is calculated only for the manufacturing sector and manufacturing growth measured by PMI is considered good indicator of industrial output. Q4. Which of the following statements regarding the recently launched GSAT -11 satellite are true ? 1) The 5,854-kg satellite, almost double the biggest one built or launched by ISRO to date, will ride up on European launch vehicle Ariane 5 ECA. 2) GSAT-11 is part of ISRO’s new family of high-throughput communication satellite (HTS) fleet that will drive the country's Internet broadband from space to untouched areas. 3) It will be the second heaviest satellite to be put on obit by ISRO after successfully launching GSAT-6 in September. Q5. Which of the following African capital cities is the closest to the equator ?